The Festool Vacuum Hose Boom Arm is a great invention, and Steve Johnson thinks I’m absolutely nuts because I don’t have one. What good is it? There are lots of uses. Relating to attaching one’s Festool Dust Extractor to any sander, it keeps the hose from dragging across your work, possibly scratching a nicely-prepared surface. Also, when used with the belt sander, it prevents the hose from holding back your progress when you wish to cover a lot of ground with the sander, which is what a belt sander does best. For any sander, it helps you maintain the surface of the sandpaper coplanar with the surface being sanded. You can do that with brute strength, or you can utilize the boom arm by adjusting its height to match the job you’re on. If I don’t have a boom arm, then, how do I accomplish these things? I have screw-hooks in the ceiling all over the shop and outdoors on the deck where I do some work too. If one bungee cord is too short, I can double up. If it’s too long, I can double over. There are lots of ways to make things work. Under threat of rain, I moved the sanding of this mantle under the First Up tent. Now, the work, the sander and the Festool Dust Extractor are all protected. 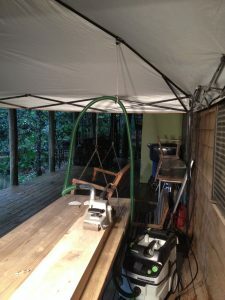 Notice the bungee cord holding the dust extractor hose at just the right angle for easy, comfortable sanding. Wire clothing hangers also work quite well. As with Jim’s bungee cords, hang them from the ceiling (overhead water and heating pipes are all over the place in my basement) and slightly recontour the hanger to accommodate the vac hose. Getting Rid of Dust Accumulation – Tips from Sticks in the Mud – November 2017 – Tip #1 POLL: Do You Use the Built-In Ruler On Your Saw Fences?